This has been something that has been on my mind for quite some time but I’ve always struggled to put it into words without coming off as condescending, cocky or downright rude. 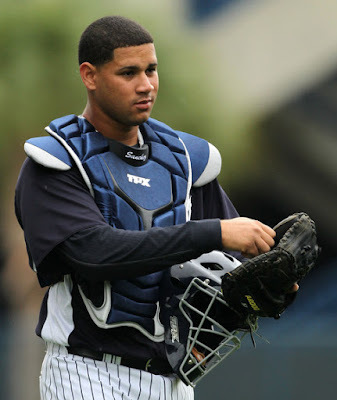 I have been content to simply roll my eyes and pass by tweets, comments and articles stating that Gary Sanchez has no future with the team, he’s the next Jesus Montero, he’ll never catch a game with the New York Yankees etc. but I received an email over the weekend that I simply cannot ignore, one that I cannot simply bite my tongue and roll my eyes at because it was absolutely ridiculous. Whoa there pal, Sanchez is an organizational prospect? First and foremost you are correct, Sanchez has been in the organization for what feels like forever. Most international free agents that sign at age 16 feel like they have been in the organization forever after five years, that’s the name of the game. Also you hit another nail right on the head, in a perfect world Sanchez is blocked by both Murphy and McCann and may never get into a meaningful game with the team without a devastating injury or disabled list trip but to say he’s merely an organizational prospect or a filler is a stretch and one that I don’t feel comfortable with letting slip by. I, as a blogger and as a fan with some would say a relatively large following, am held to a higher standard than most and I subsequently I hold myself to a higher standard because I want to lead by example. I’ll tell a Toronto Blue Jays fan as quick as I’ll tell a Yankees fan that the crap talking and trolling is unnecessary and not needed but sometimes a troll is simply a troll. I believe, well I hope, this email was a troll. If it was, you win…. I fed the troll. If it wasn’t then at least know what you’re talking about or at least be passionate about what you’re talking about because when you call a 21-year old catching prospect who dominated Triple-A pitching and is currently sitting on the bench for the Yankees a “organizational prospect” you just look silly. Thank you for listening to my rant. I admit that sometimes I get a little too worked up over prospects, I love prospects and I can’t help it, and I’ve tried to temper those expectations and my words a bit because of it. This one I couldn’t let pass, not because I’ve had conversations or a connection with Sanchez but because I feel like it is the right thing to do. To educate, that’s all I want to do whenever I can. This post was not intended to be malicious or to call anyone out as much as it was intended to put everything into perspective, I hope. I hope you enjoyed it, I hope everyone learned something and I hope that we can at least agree to disagree on the matter because I will in no way, shape or form agree to the fact that Sanchez is anything less than a TOP prospect for the New York Yankees.